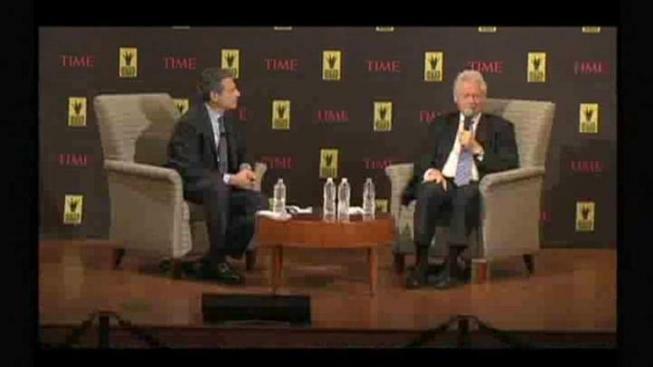 Much about Steve Jobs impressed former President Bill Clinton. But what stuck out most was Jobs' ability to figure out his gift and nourish it, even to the end. "Every one of you is good at something," Clinton told Time managing editor Rick Stengel and a sold-out Chicago Ideas Week audience Tuesday at the Chase Auditorium. "Most people are happiest doing what they're best at." Clinton said he talked to Jobs not long before he died. The chairman and CEO of Apple Inc., ever thinking of the most efficient way to tackle a problem, told Clinton the cancer was very clever. "He said, 'I have beaten it back repeatedly, but I have fired all my ammunition and it keeps coming up with more ways to attack me. I'm not sure I have any more weapons left." But that was Jobs' way, Clinton said. Once he decided what he wanted to do, he worked undeterred. "He was a very determined man," Clinton said. "He probably had the most intense powers of concentration I ever saw."